Remember – you have the opportunity to start your vacation sooner in Oahu or extend longer in Maui at Perillo’s very special discounted room rates for up to 3 additional nights. 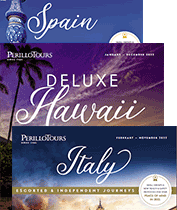 You may also travel to the “Big Island” of Hawaii on Perillo’s three night extension. Today you’ll fly to Honolulu on the island of Oahu, one of the single most dreamed of vacation spots in the world. You’ll be met with a cool, aromatic, flower-lei greeting right at the airport! Arriving in the hotel, you’ll again be welcomed by Perillo reps who will help you to settle into your room in this American paradise. ALOHA! After breakfast we set off for Pearl Harbor to commemorate the “day that will live in infamy,” December 7, 1941. Few Americans who set foot on the Arizona Memorial can avoid a few goose bumps… We continue on to the historic sightseeing tour of downtown Honolulu, followed with a tour of the beautiful ‘Iolani Palace, the only Royal palace on American soil. Tonight, enjoy an á la carte dinner at Hula Grill Restaurant with Mai Tai, wine, beer or soft drink included. Hula Grill’s menu is award winning Hawaii regional cuisine, including freshly caught seafood from the islands. You will want to try their famous “Hula Pie”! Our “Two Islander” guests transfer to Maui Airport. Your tour will end after breakfast this morning. Mahalo, and please join us again soon! If you have booked our “Big Island’ extension to the Island of Hawaii, after breakfast you will be transferred to Maui airport for your flight to Kona.